It encompasses tons of different disciplines, strategies, and tactics. As a result, developing a basic understanding of how it works can be difficult. Learning the trade can take years of dedication and honing your craft, oftentimes in a handful of specific areas (such as strategy, copywriting, or analytics). Like a lot of things, though, future success starts with solid fundamentals. And if you’re looking to learn, you’ve come to the right place. This post will cover everything you need to get started on your marketing journey. Think of it like the ultimate 101 guide, packed full of actionable advice you won’t learn in the classroom. It’s also laid out to be easy to understand, turning complicated concepts into easily digestible chunks of information. Bookmark this page, then get down to learning. Marketing Strategy Guide (PDF): Get an in-depth education on strategy. Marketing Calendar Template: Your all-in-one project planning and scheduling tool. 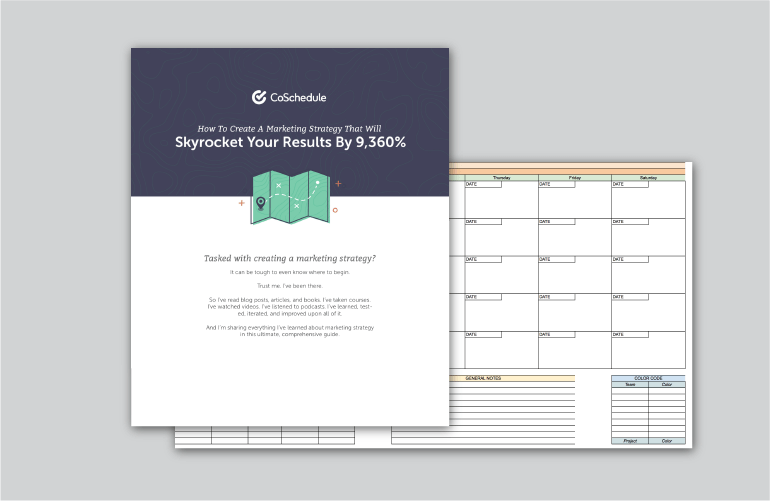 Beating Makeshift Marketing: When it’s time to build your marketing tool stack, see what makes CoSchedule the best option for getting organized. Get all three for free (it only takes a few moments), then continue with the rest of this post. In simplest terms, marketing is the act of driving profitable customer action. It spans the full scope of strategies and tactics organizations use to position products and services in the marketplace, and motivate target audiences to make a purchase. 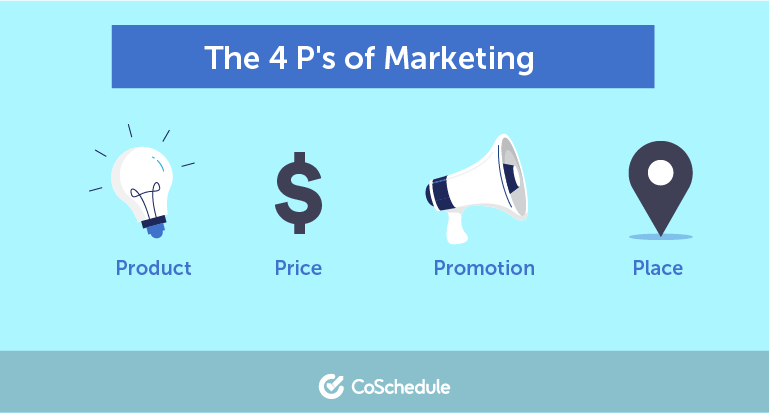 For all its complexity, at its core, marketing revolves around four things: product, price, promotion, and place. Tactics and channels change, but these are the concepts everything else revolves around, and they’re principles that never change. Some models expand these basic principles to 7 P's, or another variation. But, for your purposes, these four should be sufficient for developing an understanding of how marketing works. How many different product variations or lines should be sold? For example, a car manufacturer might strategize on which vehicle categories to build (such as family cars, SUVs, crossovers, or pickup trucks). How should they be packaged or presented? To make another example, if a company made replacement car floor mats, should they come in a box? A bag? Something else? How will it be serviced? This could include warranties, handling returns, and so forth. Marketers might even have some involvement in determining how products are designed and which features they might include (here at CoSchedule, for instance, marketers and product developers communicate closely). Marketing works best when marketing teams communicate with product teams. This is just “how much stuff costs,” right? Well, sure. But there’s more to it than that. Price means more than just what stuff costs. If marketing is all about driving profitable action, then prices need to be set at a level the market will support. What is the market rate per unit of a product? This requires some market analysis and competitive research to determine what’s a fair price for a product, given its cost to produce, and what people are willing to pay. How should discounts be timed and applied? Should the product be put on sale at certain times of year? Does it make sense to give customers options for payments? A car dealership might offer financing options, rather than expecting people to pay the full price up front. If a product launches but no one cares, does it even exist? Well, yeah, technically it does, but it’s just taking up space if no one’s buying it. Once a product is out there, it needs to be promoted so people know it exists. Which channels will be used to promote the product? This includes online and offline channels. Where will it be promoted? Online? Offline? In stores? At events? What message needs to be communicated? What copy and verbiage will tell audiences what the product is all about, and encourage them to buy it? The right product needs to be in the right place for people to find it and buy it. Where is the product distributed? Online? Offline? Will specific locations get the product? For example, if you sell cold weather clothing, you might not distribute as much to Florida and you might in Minnesota. Spend a little bit of time researching marketing online and you’ll find references to all different areas of marketing. Here are some that are most likely to be relevant to your work. The hype around content has been building steadily for years, and with good reason: people want to be helped and informed more than they want to be sold to and interrupted. The “content” part of content marketing spans a lot of different things. Primarily, this means blogging and website content, but it can also include email, social media, video, ebooks, or any other type of digital content used for marketing. It can also include print collateral, like brochures or magazines. When it comes to driving conversions, it’s tough to beat the return on investment of email marketing. Different studies cite different figures, but it’s generally accepted that it drives around 3,800% to 4,200% ROI (meaning that for every dollar spent, it produces $38 to $42 in revenue). Organic reach on popular social networks is declining on popular platforms like Twitter and Facebook, but social media marketing is far from dead. It’s effective for building brand awareness, developing community, and getting your content and products in front of new people. Did you know that over 400 hours of video gets uploaded to YouTube every minute? That’s incredible. So is the fact that it’s the world’s second largest search engine (second only to Google, which owns YouTube, and even bigger than Bing and Yahoo combined). It’s not the only video platform out there for marketers to know about, either. Wistia is practically the industry-standard for hosting embeddable web video, and Vimeo is a fantastic place for creatives. Plus, social video on Facebook (and to some extent, Twitter as well) is also becoming increasingly important. Have you ever seen those ads at the top of search results? Those are pay-per-click (PPC) ads. PPC advertising offers marketers excellent opportunity to sell products directly to searchers. It’s also great because it makes it possible to see exactly how much you’re spending vs. how much revenue your advertising efforts are generating. Few, if any, tactics or channels drive more traffic on average than search engine optimization. Few digital marketing tactics drive more traffic than search engine optimization. It’s the process of structuring content and executing other tasks that help improve your site’s search engine rankings, pulling in an audience that’s interested in the topics your site covers, and the products your company sells. Even in an era packed with new and flashy channels and tactics, good old-fashioned relationship-building remains essential for effective marketing. PR is all about managing perceptions and relationships, ensuring people think positively about your brand. Why talk up your products yourself when you can have trusted folks promote them for you? That’s the crux of influencer marketing, which involves working with popular people within a given niche or industry to put your products in front of their audiences. How will you encourage them to take that action? How will you measure marketing’s impact on influencing that action? This framework is simple to understand and yet difficult to master in actual execution. So, why is strategy important? Think of marketing like taking a trip. Sure, you could just hop in the car, and take off with no sense of direction. But, you’ll probably just waste time, burn gas, and never end up anywhere meaningful. If you had a map and an itinerary though, you would have been prepared to make the most of your time, and actually accomplish something. That’s what strategy gets you. A sense of direction, so you can use your time effectively, understand why you’re doing your work, and increase the odds of achieving your goals. First things first, companies exist to serve customers. Well, figuring out exactly who those customers are, and what problems they need solved, is easier said than done. Once you’ve determined who you need to reach, the next step is figuring out what’s required to move them toward a sale. For some companies, this is simple: convincing customers to grab a product and buy it at the store. But, there may be actions you drive them toward before reaching that step (such as getting onto a mailing list or becoming a social media follower). For others (for example, service-based companies), you might want to get leads (potential customers) to place a phone call for a demo or a consultation before they commit to purchasing. When determining actions you want your audience to take, it’s useful to understand how the marketing funnel works. 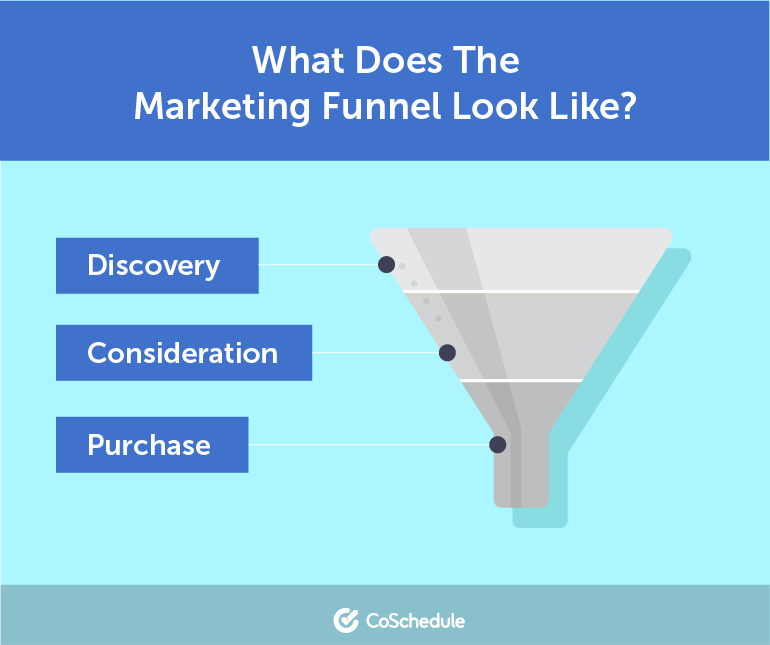 Funnels help illustrate where customers are at in the buying process, from being unaware of a product (or having a problem), to researching different options, down to making an actual purchase. Top of Funnel (TOFU): The customer is unaware of a product or company. Middle of the Funnel (MOFU): The customer is actively researching products. Bottom of the Funnel (BOFU): The customer is ready to buy. Part of an effective strategy is narrowing which tactics you’ll implement to achieve your goals. When you’re just starting out, this can seem daunting. There are always more thing you can do, than what you actually have time to do well. 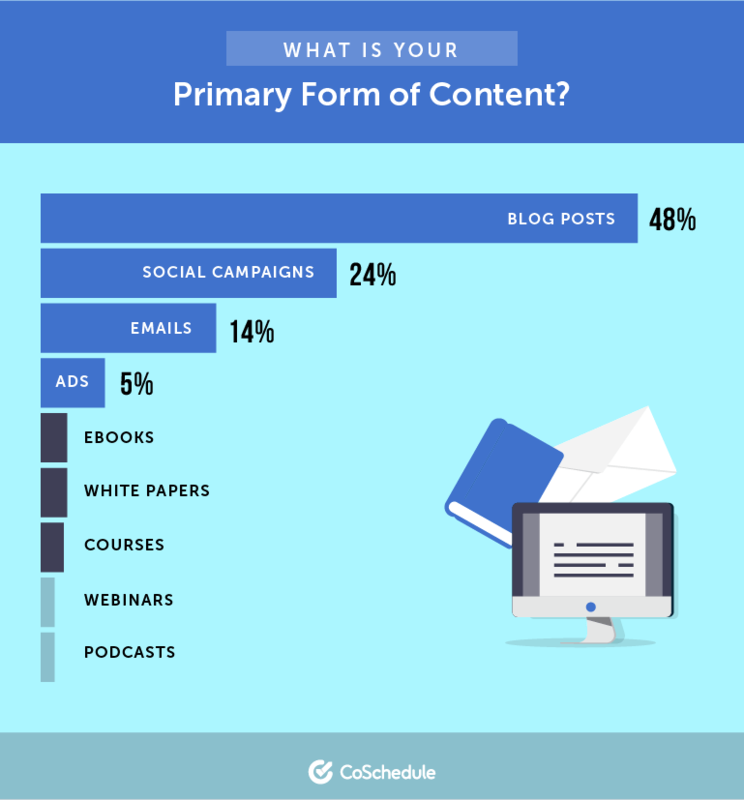 Notice that blogging, social media, and email marketing round up the top three. For most companies doing content marketing, those are the three most obvious places to start. But, determining which tactics may work best for you may be another story. Maybe you’re doing marketing, but not content marketing specifically. Maybe you’re in an industry or role where marketing means doing things like securing partnerships, hosting events, or doing “traditional” marketing (like producing print collateral). Know your audience. Who are you trying to reach? Figure out where those people hang out. Where can you reach those people? Think on which tactics and channels could reach those people, in those places. Which marketing activities could be used to reach the right people, in the right places, at the right time? That’s an open-ended question, but whatever the answer may be, that’s where you should start. Once the strategy is in place, it’s time to put it into action. Once marketing strategy is in place, it’s time to put it into action. Having the right skills. Once you know what to do, you need to know how to do it. Having the right staff. Putting the right people in the right place is key to success. Having the right tools. A professional always uses the best available solution to tackle a given task or problem. What Are Some Common Marketing Skills? The skills a marketer needs depend on their role. Verbal communication. Marketing is all about communication. Being able to express your ideas clearly is key. Writing. You’ll be doing a lot of writing, whether creating content, or emails to stakeholders. Research. The more granular, often the better. Analytics. Understanding how to spot trends in data is essential. How Are Marketing Departments Usually Structured? The way teams are built depends on the company’s size, industry, budget, and a lot of other factors. Some companies have teams of one, while others might span multiple marketing teams across multiple departments or business units. How Are Marketing Tool Stacks Typically Built? The tools those teams use to execute their work might vary depending on tactics and personnel. Project management tools: Needed to keep teams organized and projects on track. Social media scheduling tools: Because manually scheduling posts at scale is nearly impossible. Editorial and marketing calendars: Used to set deadlines and map publish dates. Email marketing platforms: Important for managing email lists and delivering newsletters. Marketing management platforms: Tools like CoSchedule, which consolidate several of the tool categories listed above, while integrating with other popular tools. Analytics tools: Used to measure performance. SEO tools: To monitor keyword rankings, do competitive research, track incoming backlinks, conduct keyword research, and more. Marketing automation tools: Used to automate processes, such as email flows. CRM (Customer Relationship Management) software: Powerful platforms used to store customer data and maintain relationships with consumers. If you can’t measure the impact of your marketing activities, then you may as well not be doing anything at all. Every action should always be connected to specific metrics, in service of achieving a specific goal. One of the best things about marketing is you’re never done learning. And in effort to support your learning, CoSchedule (and a lot of other great companies) are committed to helping you develop your knowledge and skills. CoSchedule Academy: Find exclusive educational content and level up your skills. CoSchedule Blog: Enjoy this post? You’ll find tons more here (plus fresh content each week). Actionable Marketing Podcast: Features new interviews each week with leading marketing experts. The 10X Marketing Formula: Comprehensive book from CoSchedule co-founder and CEO Garrett Moon. There’s a lot of information to process in this post. But, now that you’ve covered most of what you’ll need to know as a marketing practitioner (both on the surface level, and with links to deeper reads on tons of sub-topics), you’re now better prepared than ever to continue your marketing education and level up your career. Is there anything we missed? Let us know below. Getting started learning about #marketing? Here's the ultimate all-in-one resource you need.